At 16 years old, I started my first job at a roofing company during the summer of 1992. I had a friend whose father owned a roofing company, which made it convenient for me to get a summer job. I was a laborer on the crew, setting up and cleaning up the work site every day. There were a lot of things I liked about the trade immediately after I started working in high areas outside and being at a different work site almost every day. About 3 years and 1 different crew later, I started installing and conducting repair work. I always kept my eyes and my ears open, always learning something new about the trade every day. I was never a good student in school and knew my place was on the roof, not a classroom (Mom was not happy). By the time 2002 came around, after working for a total of 4 different contractors, I knew how to install and repair any sloped roofing system and s variety of commercial flat applications. By this time, I found I had self employment on my mind. In April of 2002, I registered the name 'Edwards Roofing & Repair' with the Missouri Secretary of State. Remember this logo? Our original logo has been updated as our company has evolved from roofing and repair to all of your exterior needs! I hired a couple of guys, strapped a ladder on my 1996 Nissan Pathfinder, purchased a few roofing tear-off shovels, an air compressor, a couple of nail guns and some insurance. Slowly but surely, I started contracting work on my own. Having just getting started independently I didn’t always have work. To fill those days, I subcontracted for a small hand-full of different roofing contractors. I was operating in this manner for about 6 and a half years. I knew if I was always consistent and provided a good job for my customers, my business would eventually grow out of the infancy stage. I always told myself "no matter what, always do everything in your power and never to leave a customer unhappy". Knowing that with time and consistency, my word of mouth marketing will eventually evolve. Right at the end of the summer of 2008, I had to quit managing a crew to be able to keep up with my growing number of customers. I started with one crew of roofing installers, who still work for me to this day. I also started working with a crew of gutter installers and a crew for siding. I quit subcontracting and became a full-time competitor, 100% on my own. I also became a credentialed contractor with the oldest manufacturer of roofing materials in the country, CertainTeed and became an accredited business with the Better Business Bureau with an A+ rating! By the time 2011 came around, I was lucky enough to have a handful of great, devoted customers. I built solid business relationships with a couple of big clients like Mercy and The Wellington Group. I had reputable relationships with insurance agents who can now trust me to give honest assessments on whether or not their client/clients should file claims of loss with their home owners insurance policy. I had developed the capability to handle any type of commercial roofing system, no matter the size or application. Soon enough I had even started contracting and coordinating more exterior trades like fences, decks, retaining walls and windows. I believe working my way up from the bottom of the roofing trade for over 25 years has given me a superior knowledge about the trade. 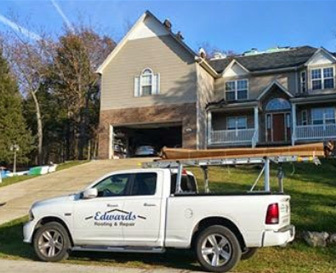 As a contractor, it has given me a great advantage over a lot of other roofing contractors in the industry and can quickly identify any type of roofing issue in half the time without even putting a ladder up. The installers perspective enables me to be a great consultant, helping you achieve any roofing and exterior goal for your home within your budget. It also helps me keep business cost down to a minimum without cutting any corners. Having worked a few years as a subcontractor for other contracting firms helped me realize what makes a contractor bad, good or great. Here is my pledge to you... My staff and I will never attempt to sell you anything you do not actually need. I will always make sure my contracts are thorough and detailed so there are never any surprises. I will always do my best to make sure what we tell you is going to happen, actually happens. Your representative, whether it's one of my staff or myself will always be readily available for any questions or concerns you may have. Also on most residential jobs, we do not expect to be paid in full until you are completely satisfied with your project. Now in 2017, over 25 years after my first roofing laborer position and 15 years as a business owner, we continue to grow year after year. I am able to offer my customers the absolute best warranties in the industry, hard for any of the competition to match and impossible to beat. 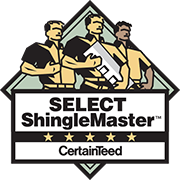 I hire nothing but professional installers and make sure they all attend classes required by CertainTeed to retain our 'Select Shingle Master' status. I make sure that it is easy for my customers to keep in touch with a representative or myself so we are able to be at their beck and call for any questions and concerns from start to finish after at our first meeting. I have 3 teenagers who are showing various degrees of interests in getting involved with the family business, but only time will tell what they decide to do when they are finished with school. 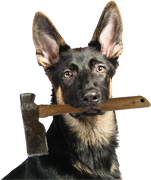 This is Eva–she is my 4-year-old East Working Line German Shepherd who follows me everywhere I go. You’ll often see her in the passenger seat of my truck with her head out the window, taking in her surroundings and getting ready for our next project. Once our customers notice her, they love her. Eva enjoys greeting our clients with her wet nose and wagging tail, ensuring each project gets started off on the right foot. My only goals are to grow at a natural pace, continue conducting business in a fair and honest manner and only offer the best products on the market to my customers. My family and I love running this business and it is always an honor and pleasure to meet and serve other families in the community each day. I want to thank you for your time, consideration and the opportunity to earn your business.